Like millions of other girls in the 1970s and ‘80s, I grew up watching Melissa Gilbert grow up on TV, playing the irrepressible Laura Ingalls on “Little House on the Prairie.” I read the “Little House Books” (“On the Banks of Plum Creek” and “Little House in the Big Woods” are still my favorites). 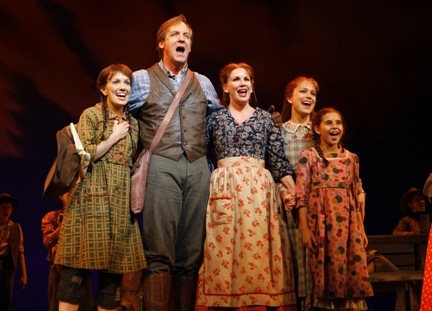 So, I read with apprehension – nay, dread – that the Guthrie, that venerated theater in Minneapolis, was producing something called “Little House on the Prairie – the Musical.” And I read with dismay as critics from Variety to the New York Times proclaimed it lackluster, if charming. Thus, it was with curiosity and hope that I went to the Hobby Center to watch TUTS, Houston’s venerated producer of musical theater, bring the show to the Bayou City (at the Hobby Center, through May 9). Could it be that you can go home again? It turns out… yes and no. “Little House – the Musical” borrows its material from both the series of books and the television series, much the same as the new stage version of “Mary Poppins” borrows its material from the P.L. Travers classics and the wildly popular Disney movie that made Julie Andrews a star. It tells the story of Laura Ingalls and her family’s pioneering adventures in the area around De Smet in what is now South Dakota, in the 1880s. When we first meet Laura, she’s about thirteen; the musical takes us on a journey over a few years, up till her marriage to Almanzo Wilder. The lush musical score by Rachel Portman transports the audience through the wild prairies of Laura Ingalls’ youth. It soars and moans and sighs, evoking the hope, tragedy, poverty and faith that met the Ingalls family across their lives as pioneers. It’s one of the true showstoppers of this production. Unfortunately, the book and lyrics don’t quite hold up against the majesty of the music. Some of lyricist Donna Di Novelli’s numbers, including the opening trio of “Thunder/Up Ahead/The Prairie Moves” are stunning pieces, structured with exposition and propel the production forward. Others, like “Good” (and its reprise) and “Faster” provide rich soliloquy and beautiful character exploration. But nearly all the others borrow situations from five of the “Little House” books and are little more than vignettes. Ditto Rachel Sheinkin’s book, which is clearly written to tell a through story, but somehow comes off slightly disjointed. As Laura, Kara Lindsay simply shines. Anyone who remembers Melissa Gilbert’s Laura on the TV series will delight in the way Lindsay takes a well-known role and makes it her own. She brings boundless energy, a voice to watch and a well-developed sense of narrative and timing to the feisty main character. She is utterly believable every minute she’s on stage. A true standout performance belongs to Alessa Neeck as Mary, Laura’s older sister. The role isn’t much; it’s mostly designed to showcase Mary’s serene goodness to Laura’s wild exuberance. But Neeck’s singing voice is like spun gold, and she folds herself into the role. The star power billing of “Little Hosue” goes to Melissa Gilbert as Ma Ingalls. Much has been made of the original Half Pint all grown up and back on the Prairie. But I can’t help feel that Gilbert’s acting talent goes greatly unused. She brings an America’s sweetheart and home-town girl feel to her performance, but Ma doesn’t have much to do. By the time she does, in her solo Act II number, “Wild Child,” it almost feels as if the creators looked around and said, “Dude, wait. We need a song for Ma now.” Regardless of those challenges, Gilbert delivers and her emotion and embodiment of her character ring true. Steve Blanchard gives a great performance as Pa Ingalls, and Kevin Massey packs a theatrical punch as Laura’s beau, Almanzo. Kate Loprest, as Laura’s nemesis, Nellie Oleson, probably has the toughest role of the show. Nellie’s written as comic relief, likely more from fans’ beloved remembrance of Alison Arngrim’s tour-de-force portrayal of the little prairie brat on the TV series. But here on stage, the role tries too hard and becomes an incongruous over-the-top presence in what is a more simple and down-to-earth production. Nonetheless, Loprest is brilliant with her Lucille-Ball-esque physical comedy and her vocal power makes her a performer to keep an eye on. Adrienne Lobels’ scenic design consists mostly of painted screens and minimal sets, which lend themselves nicely to showing the vast emptiness of the wild prairie. Mark McCullough’s lighting is just absolutely beautiful. “Little House” might be uneven, but it’s a true crowd pleaser. Who couldn’t love a production about a family that chases after its dreams, facing every joy and tragedy with faith? At its core, that’s what this is about, and the audience clues in on it. The musical isn’t overly sentimental, which speaks volumes for it, given how its TV predecessor has been oft-maligned for being big on schmaltz. Here on stage, there’s a simple and unwavering sincerity that surely hits home. Actor Bryan Batt of TV’s Mad Men fame and I have, I think, only one major thing in common – and that thing goes by a two-word name: New Orleans. Both of us were born and grew up there, though I a decade before he did. Both of us came to understand its arcane rituals and tangled social labyrinths, even though he had personal encounters with more of them than I did. And both of us watched the tragedy of Hurricane Katrina from somewhere other than New Orleans – I from a life in Texas, he from a vacation in Sonoma. To have that two-word name in common, and then to read his new memoir She Ain’t Heavy, She’s My Mother (Harmony Books, $24) makes the experience a wild, eye-opening and lump-in-the-throat ride through the very different lives he and I led in the very same locations. The fact that Batt’s family owned (and his grandfather created) the now-gone amusement park called Pontchartrain Beach, where I virtually lived every summer, only ups the ante, I’m afraid. I can almost see – almost – my own late mother and father sipping from a shared Tiki Bowl at the faux-Polynesian Bali Hai restaurant as I raced between the Zephyr roller coaster and something called The Wild Maus. It was neck-and-neck whether their evening or mine could leave a person feeling sicker. In the “art imitates life” department, there’s something thought-provoking about an actor who played a closeted gay advertising art director in early 1960s New York (three seasons as Salvatore Romano on the award-winning AMC series) writing about his own coming out 15 or more years later. Clearly, thanks to a lot of social and cultural changes, these were two different Americas – and therefore Batt’s own journey seems a great deal less agonizing than Sal’s. Many readers will be struck, in fact, by the full acceptance and support he felt all around, from his older brother Jay (who apparently had only an off-color wisecrack) to his mother, who perhaps understood better than anyone all along. The biggest surprise on this score, as on several others, has to be Batt’s late father. Perhaps it had something to do with John Batt’s feeling overshadowed by his father, Harry Batt the great and powerful, that helped him see, through his own dark struggles, that his son was involved in nothing more or less. The alcoholism that claimed John Batt’s life at age 55 and the single extramarital affair that nearly split apart his family are bedrock pieces of this family saga. They are related with insight, just enough objectivity to apply some facts, but mostly warmth, deep understanding and everlasting love. As the title implies, She Ain’t Heavy is primarily about Batt’s mother, Gayle. It may be a bit of a cliche, a gay man writing about how much he loves his mother; but that isn’t how this feels at all. For one thing, the tale is peppered – no matter how much the guy drank and cursed – with moments in which young Bryan felt accepted by his father. For another, his portrait of Gayle is clear-eyed enough, all things considered, to give our shared literary canon yet another Steel Magnolia, though definitely a Magnolia New Orleans-style. Despite the book’s promotional copy, nothing is generically “Southern” about Gayle Batt. She races from D.H. Holmes to Rubenstein Bros. on Canal Street after lunch at Galatoire’s, picking out outfits for Spring Fiesta, the Mad Hatters Ball or the next high-society Carnival wingding. As she grows older, her faith and courage in the face of illness, numerous surgeries and inevitable decline give the book a poignancy that anyone who’s been around this earth a while can share. She Ain’t Heavy succeeds on a couple other levels as well. It is, though to a lesser degree, a showbiz memoir, with Batt’s early tendencies to be “theatrical” leading him to, well, theater. His contributions to Broadway successes like Starlight Express, Cats, Beauty and the Beast and Sunset Boulevard are sketched in against the passage of time – bookmarked by such events as the death of Princess Diana and, of course, the terrorist attack on the World Trade Center. The “tricoastal” life that came with Sal and Mad Men will intrigue members of the show’s cult-like following, though the narrative stops short of Sal’s apparent disappearance from the show in late 2009. And the book is also a restrained love story, describing Bryan Batt’s 20-year partnership with Tom Cianfichi, with whom he now owns the Hazelnut gift and home accessories shop in uptown New Orleans. On these pages, Batt doesn’t seem to be fighting any battles, making any political statements, or grinding any axes. Whether he’s writing about Tom, his mother, his father or his brother, this is just another human love story. And everybody loves one of those. 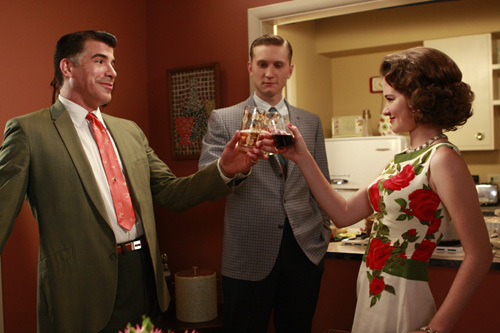 Photo: Bryan Batt (left) in a scene from Mad Men.